The digital banking revolution has only just begun. Today only few traditional banks offer their customers high-quality web and mobile sites/apps. More and more consumers around the globe are demanding that the digital channels of a Bank should be present in all micro-moments, such as making a purchase or investing in Bitcoin. Manager digitale internazionale del settore finanziario. Ottimista digitale, fintech lover e API entusista. I bet that, at least once in your life, you found yourself with that unstoppable will to throw your mobile phone against the wall because it was stuck. Am I right? What´s creating such a big issue? Is it true that in the digital era even a single second matters? The idea for this article came up after reading the results of a Google survey indicating that internet users expect that a website should load in 3-4 seconds. If it takes longer than that, users are likely to move to the competition. In fact, 40% of users are likely to abandon a site if it doesn't load within three seconds. Those results have major impacts on the e-commerce and also on banking apps. It is necessary to take a step back to understand the concept of time in the modern era: we believe that speed has only been part of our digital era but this is not true, what we are experiencing is an exponential acceleration of already existing dynamics. In fact, the concept of speed has always been related to inventions and technology. As early as 1900, George Simmel described the acceleration of life in modern cities and depicted it as characterized by “immediacy, simultaneity and presentism”. Another common belief is that this speeding up of our habits is due to technology per se, but this imperative of speed comes from a cultural change and is due to the set of priorities that we choose. Technology is uniquely giving us the possibility to reshape the quality of our time, allowing us to do more, better and faster. Mobile technology allows the intermediation and coordination between 2 or more activities and this key factor lead us to a new relationship with the time, the “presentism”: a life style where everything is in real time and constantly updating. In this new dimension, the past and the future have ultimately lost relevance; they are blended in a mix of instantaneous experiences. Digital technology is based on choices and therefore the digital timeline doesn´t move from moment to moment, but from choice to choice. This is an ongoing process and no interruptions are allowed. If the application I decide to use is not answering, it means that the choice was wrong and I´ll need to make a new one, thus the previous necessity is erased and a new one is created. Be quick, the digital experience must be frictionless, eliminating the unnecessary steps in the journey of the customer towards the achievement of his objectives. The benefits of “contextual banking” are numerous; certainly there is the possibility to enhance customer experience with instantaneous payments, more visibility and control on cash flow, account and transaction updates as well as valuable push notifications. Granting what has been defined as “ubanquity”, that is, the possibility for the bank to be everywhere all the time in the (financial) life of its customers. Another relevant gain is the increase in the conversion rate. Over the last few years, several studies revealed the connection between loading time and the % of users who achieve the objective they had set at the moment they were accessing the application. On top of that, the speed of an application is a clear sign of quality and branding. At the end of the day, first impressions are indelibly etched into the hearts and minds of our audience. If the digital channels are of poor quality, many could think that the rest of the organization follows the same dynamic. Performance of digital channels also has an impact on the increase of transaction volumes, as customers naturally lean towards services they find the most simple and agile. Finally, as specified by Google, page speed is a ranking factor for both web and mobile searches. The intent of the search query is still a very strong signal, but a slow page could be penalized. Nowadays, we need to earn the customer´s attention at any moment, in fact, people are more loyal to their need in the moment than to any particular brand. In this context, real-time banking is designed to become the new standard for banks and, therefore, a shift in this direction becomes imperative. Banks who will not embrace these changes are inevitably destined to lose relevance in the relationship with their customers and consequently the value in the customer proposition and market share. 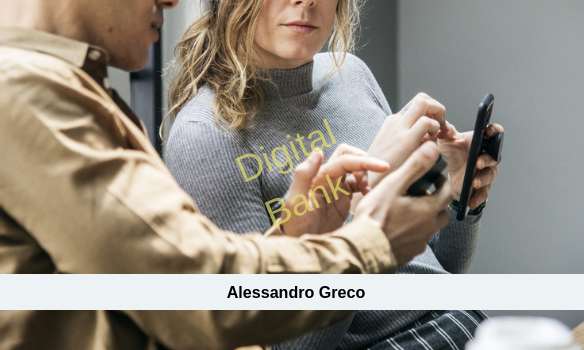 The most important change is in the conception of the services: in order to maintain and gain customers in the future, banks will need to migrate the entire product and service value chain towards the instantaneous delivery of all banking offer range. Ottimista digitale, fintech lover, API entusista e evangelista agile. Mi considero curioso in imparare cose nuove o nel tentare di farle in modi differenti. Sono un "manager digitale errante" del settore finanziario. La voglia di crescere e lo spirito d'adattamento mi hanno permesso di sviluppare una carriera internazionale lavorando e studiando in 8 paesi negli ultimi 14 anni.